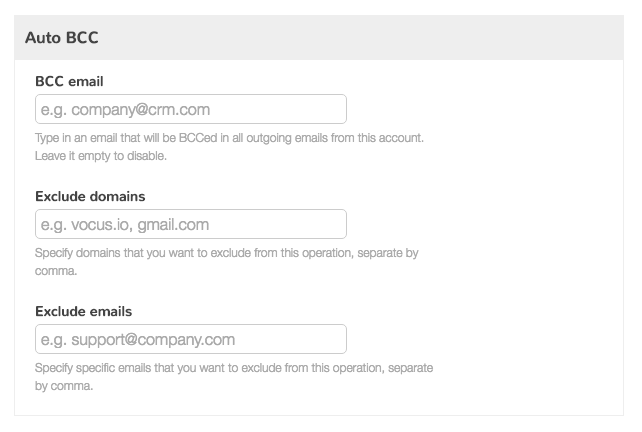 You can easily configure Vocus.io to automatically log outgoing emails to Pipedrive. This includes regular emails, scheduled emails, emails from automated followups, and emails from mail merge. You can also manually log replies from your leads and setup rules to exclude internal emails to your colleagues. CRM integration is available from the Dashboard > Settings. To setup Pipedrive, first you need to find your "Universal address" that was given to you by Pipedrive. To find this address, open any deal under your Pipedrive account and look for the "Universal address" within the lower left of that screen. This address will look something like "yourcompany@pipedrivemail.com". Once you find it, copy that email and open your Vocus.io Dashboard, navigate to integrations and choose your work email, scroll down to "Auto BCC" section and paste it in the "BCC email" field. That's it! you are now good to go. You can exclude automated logging of emails to individual addresses or whole domains, such as your teammates, by specifying the addresses and the domains in the fields above. This can be accomplished from the same view where you setup a BCC email. Sometimes you'll want to log an email that you received or a reply to your message. 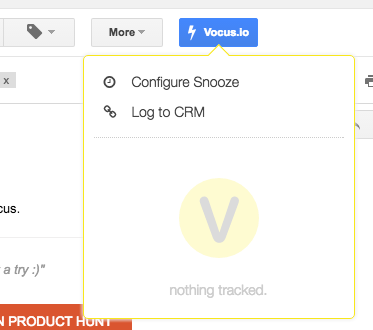 This can be accomplished with two clicks: open the email that you want to log, click on "Vocus.io" button on top of that email, and choose "Log to Pipedrive". Your email will now appear under the Mail tab within Pipedrive.